This is an amazing map compatible with MCPE (or more correctly Bedrock) on which there are several locations from Five Nights At Freddy's 2. This creation differs with new textures and animatronics added for a greater creepy atmosphere. Also, do not forget that there is the FNAF Pets addon, which will help you get to know the main characters of the game. In some places you will be really scary, but in fact this map is a demonstration of what FNAF looks like in Minecraft PE. New blocks, paintings and mobs are beautifully detailed and executed in a cubic style. 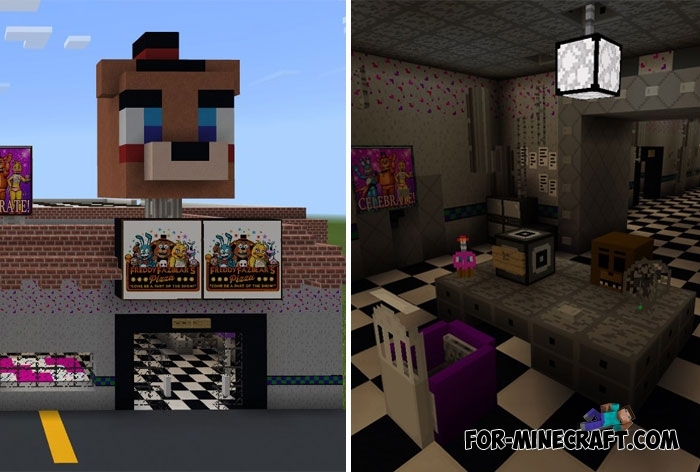 Five nights at freddy's map for Minecraft PE 0.14.0For sure you played or have heard about the game "five nights at freddy's". YOU LITLE RASKOL.I can dawnload it!!!!!!!! !